From the moment Sir Henry Royce introduced the Rolls-Royce Phantom in 1925, it was judged ‘The Best Car in the World’ by the cognoscenti. 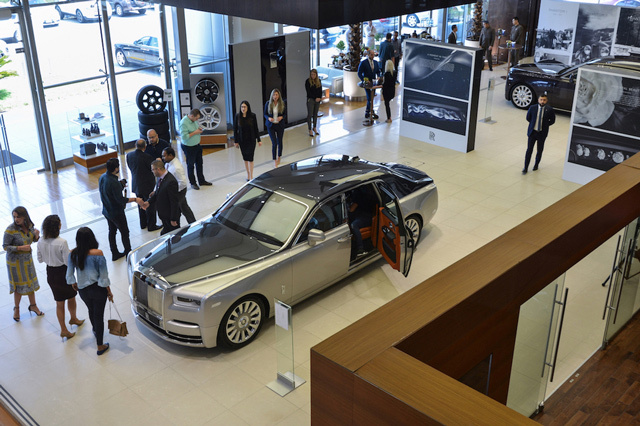 The flagship car was displayed at an exclusive event at Abu Dhabi Motors, the sole dealer for Rolls-Royce Motors Cars dealer in Abu Dhabi and Al Ain and the ‘Best Bespoke Dealer Worldwide’. Attendees were granted a behind-the-scenes look of the New Phantom with live demonstrations of its features from the in-house team. Approximately 30 per cent more rigid than the spaceframe architecture displayed on the Phantom VII, the new architecture exemplifies the next generation of Rolls-Royce, delivering the ultimate experience in terms of ride comfort, acoustic comfort, seat comfort, exterior presence and interior space. The major benefits of the new architecture for the New Phantom include its lightness, increased stiffness, efficient production of standard and extended wheelbase bodies, as well as its uncompromised exterior surface design. The all-new aluminium spaceframe structure delivers extraordinary car body stiffness for exceptional 'best-in-class' functional performance, whilst retaining its lightness. Another benchmark, the Electronic Architecture of the New Phantom, is the largest ever component produced by the BMW Group - let alone Rolls-Royce - helping to make New Phantom the most technologically advanced Rolls-Royce ever. At the heart of the New Phantom’s wholly modern design aesthetic is ‘The Gallery’, a wholly contemporary and luxury reinterpretation of a motor car’s dashboard and instrument panel area. All the elements within ‘The Gallery’ are enclosed in an uninterrupted swathe of toughened glass that runs the full width of the dash area. Within it, the instrument digital dials are framed with chrome, adding a degree of jewellery and continuity throughout the front of the interior.